Thank you for having YourSay on Henry Rolland Park. The next stage of work at West Basin is scheduled to begin in 2019, subject to National Capital Authority’s approval. Henry Rolland Park officially opened Saturday 28 April 2018 with more than 6,000 Canberrans testing out the park and its new facilities. 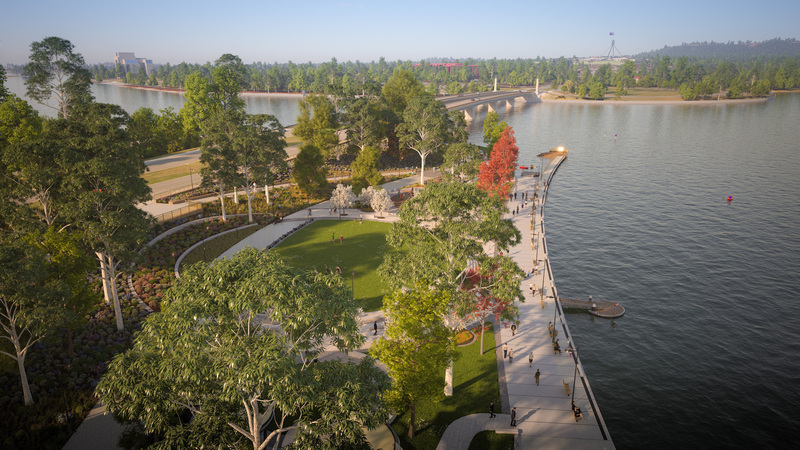 The recently opened waterfront precinct is a vibrant destination, where people meet, celebrate and enjoy one of Canberra's greatest assets, Lake Burley Griffin. A major feature of the precinct is the new public park on the headland next to Commonwealth Avenue Bridge. 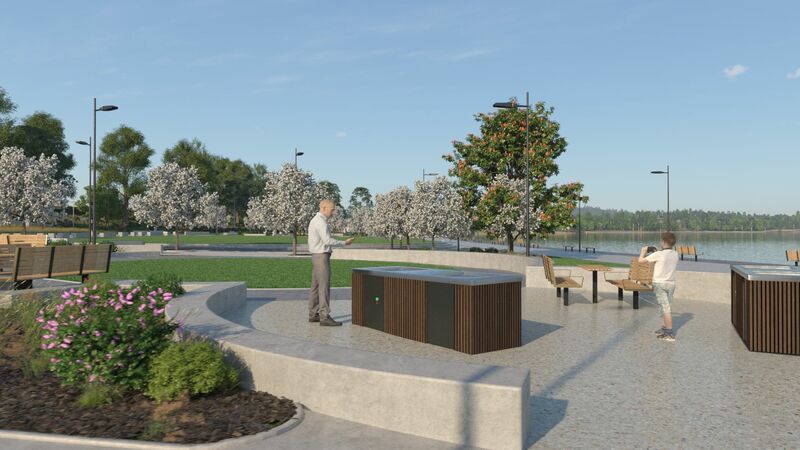 The park is on the doorstep of the city where people can enjoy Canberra's beautiful waterfront with easy and convenient access, a 150m long boardwalk, lawn areas, picnic and barbeque facilities, exercise equipment and more than 23,000 plants. construction of two public jetties. Visit cityrenewalCBR.com.au to find out more. Over five weeks we asked people to have their say on the name of the new park in an online public poll. People could choose from four shortlisted park names. The vote closed on 27 October 2017 with almost 1,500 votes cast. 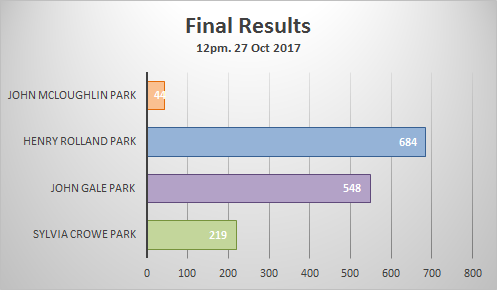 Henry Rolland Park topped the public poll, receiving 684 votes. 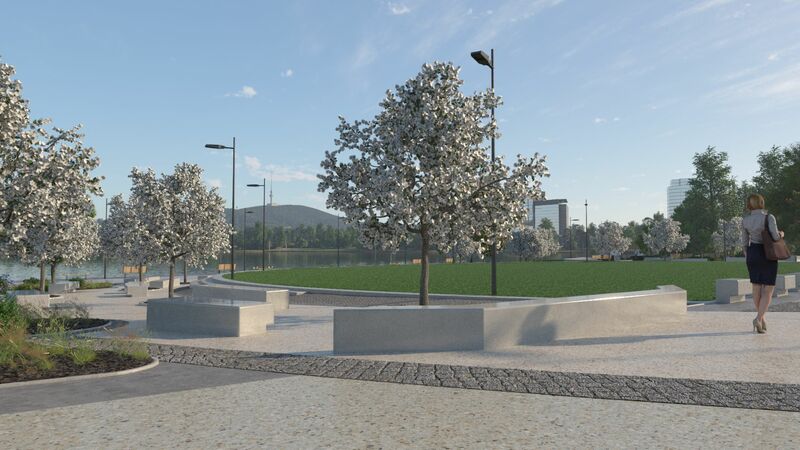 The poll results were provided to the ACT Place Names Committee, which made a recommendation to the ACT Government about the naming of the new park. 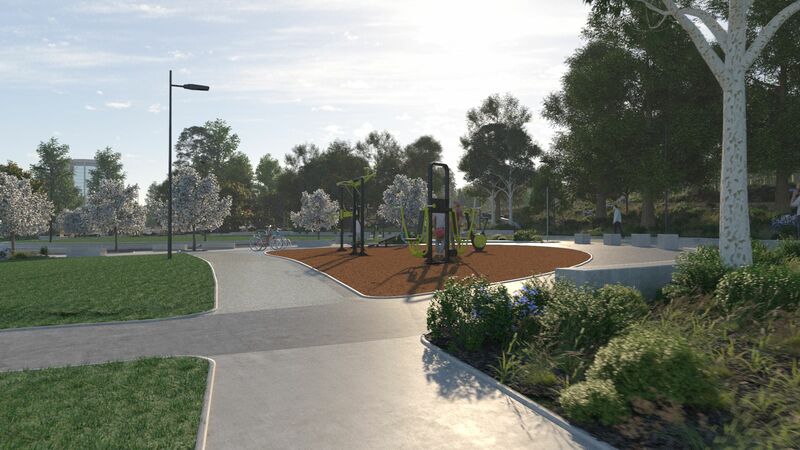 The other three shortlisted candidates for the park name - John Gale (548 votes), Dame Sylvia Crowe (219 votes) and John McLoughlin (44 votes) - were still considered by the ACT Place Names Committee for other naming honours opportunities as a way to commemorate their important legacies. As the centrepiece of Canberra, Lake Burley Griffin is a much loved part of our city. The 40km shoreline includes forests, wetlands, parks, walking tracks and cycling paths. The lake and surrounding areas is ideal for a leisurely walk and ride, or for more active uses like running, rowing, sailing and stand-up paddle boarding. There are also several commercial operators and clubs offering activities on and around the lake. The area next to West Basin, between the lake and Commonwealth Avenue, has for many years been underused. There is strong community interest to transform this area from a carpark to a public waterfront where people can relax, enjoy themselves and recreate. 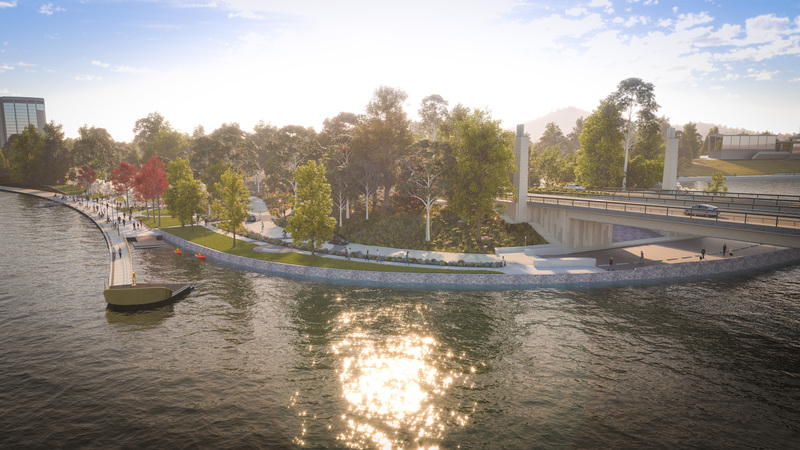 To help deliver this aspiration, West Basin is being upgraded so the community gets better, more enjoyable and easier access to one of our most beautiful lake front areas. Construction of the waterfront is being delivered in stages. 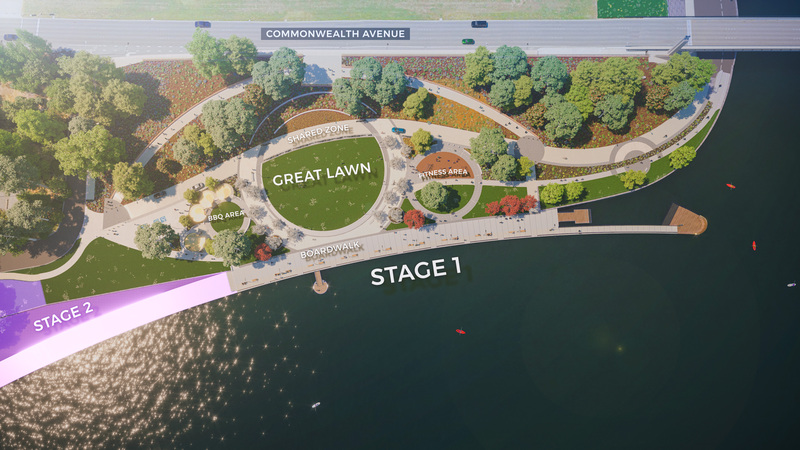 The first stage currently under development includes a new public park on the southern headland of West Basin next to Commonwealth Avenue Bridge, and lakeside promenade with an architecturally designed boardwalk on the edge of the lake. 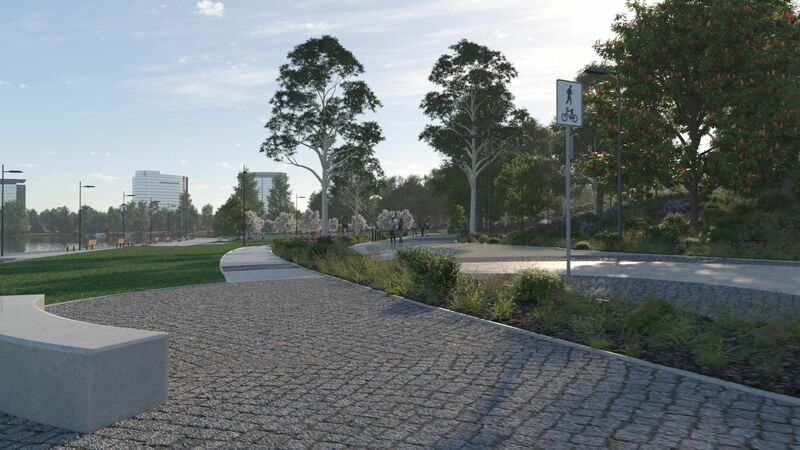 The new landscaped park will include geometric designed spaces and well defined grassed areas, wide well connected paths, barbecue facilities, public art and 23,000 plants - 86 of which are trees. It will transform the former carpark into a modern, comfortable and inviting place for everyone to enjoy. 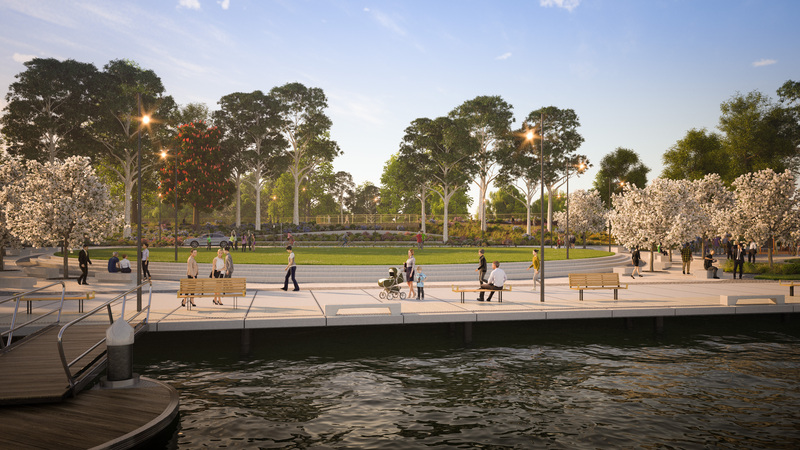 The 132m promenade for stage one incorporates an 8.1m-wide concrete boardwalk, high-quality street furniture, jetty and a protected cove, providing recreational lake users a place to berth watercraft and access the future waterfront precinct. When all the stages are complete, the West Basin waterfront will be a vibrant destination, where people meet, celebrate and have fun. The precinct will include new parks, cafes, restaurants, plazas and streets for the community to use and enjoy. 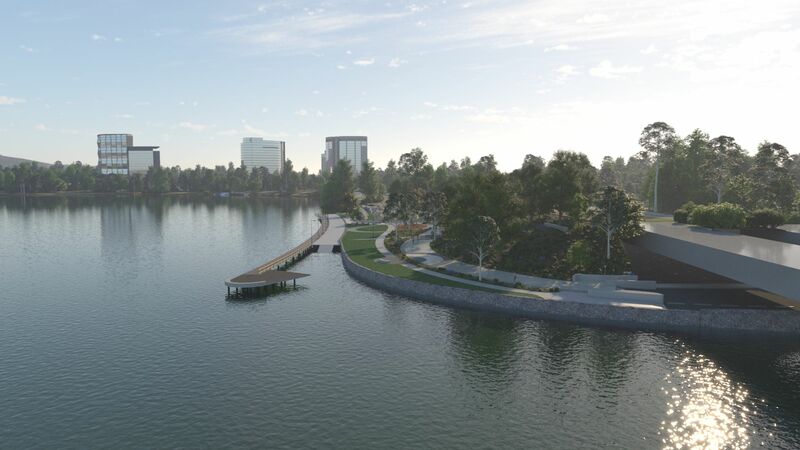 Continuous public access around the lake will remain, with access improved by dedicated paths for cyclists, runners and pedestrians. 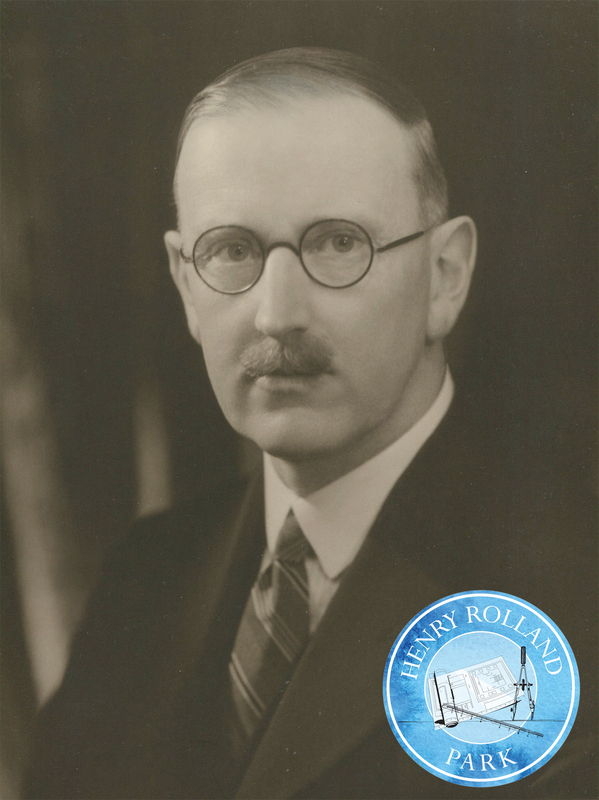 Chief architect, Federal Capital Commission; amateur artist Henry Rolland was associated with Acton as an architect and resident. He was a resident architect in Canberra during 1912-16 working mainly on the construction of the Royal Military College, Duntroon. He lived in Acton, in the nurseryman’s quarters and later with his family at 7 Liversidge Street. His residential designs included cottages in Balmain Crescent and Liversidge Street, Acton and the director's residence at Mt Stromlo Observatory. He was chief architect in the Federal Capital Commission from 1925-27, tasked with overseeing the construction of the new city of Canberra and its centrepiece, the provisional Parliament House. His contribution as chief architect was officially recognised when the Duke of York bestowed on him the Order of the British Empire after the opening ceremony. Roland published his autobiography, Over the years: an autobiography in 1971. Several of Rolland’s watercolours of the Canberra district are held by the National Library of Australia. The park has transformed a car park into a relaxing place to enjoy the lake waterfront. 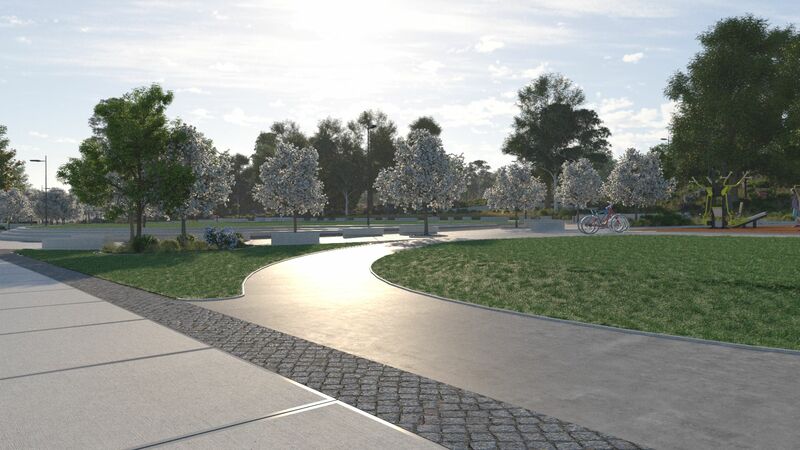 Paths for cyclists and pedestrians will link the new park to the lake's path network. Exercise facilities provide a convenient place for people to improve their health and fitness. Open green spaces surrounded by trees create a comfortable area to enjoy the new park. 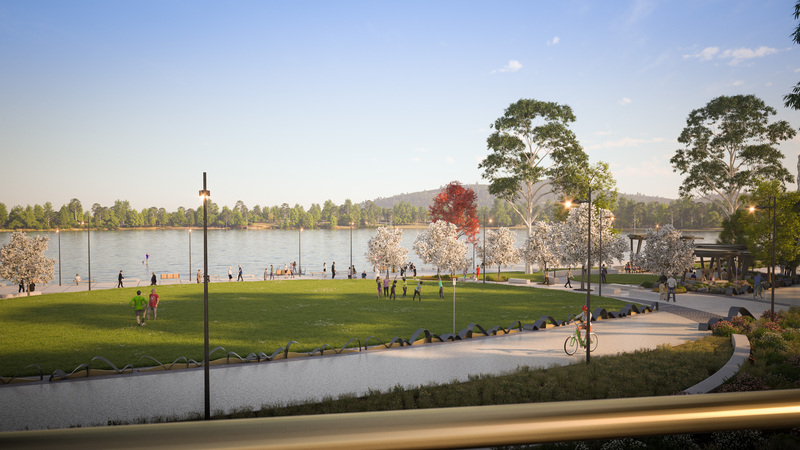 The new park is an attractive location to enjoy views of Lake Burley Griffin. BBQs provide a great opportunity to get together with friends and family. A city precinct that attracts people, industry and investment and creates sustainability and opportunity for our community now and into the future.